There are currently 147 people online. 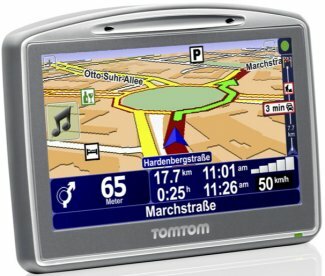 TomTom introduced a new GPS navigation system, the Go 920 T which features 4GB of storage capacity and a build-in FM transmitter. The TomTom Go 920 T has a large 4.3" LCD display with a 480 x 272 pixel resolution, a 400MHz processor, SD memory card support, RDS-TMC traffic receiver, Enhanced Positioning technology, Bluetooth support and even a Bluetooth remote.. The unit measures only 118 x 83 x 24mm and has a battery life of 5 hours. You can expect it in retail stores in the fourth quarter, just in time for the holiday rush.